We renovated a corner of the Naramachi Civic Center in Nara City. Deliverables included a space where tourists as well as locals can gather after all the nearby shops have closed down and experience the appeal of the city. 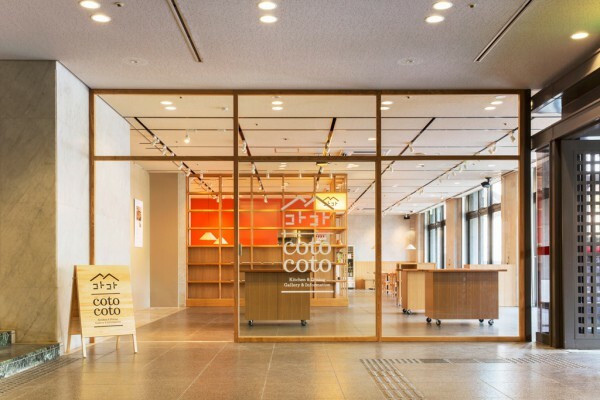 In Japanese, the name of this event and dining space, "coto coto" echoes the wish to bring and join together the many undiscovered valuable "things" (koto) of Ancient Nara (Koto-Nara), while evoking the "rattling sound" the lid of a simmering pot makes to Japanese ears (koto koto). Various activities are held in the event space, which convey the charm of Nara as a city. 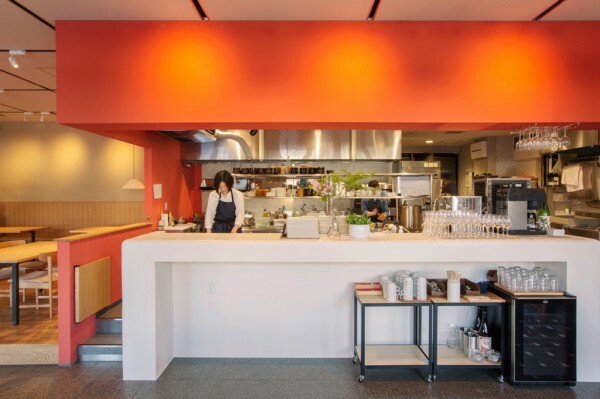 Also, the dining space features food made from local produce called "traditional vegetables of Yamato" (Yamato dento yasai) as well as craft beer and sake from Nara Prefecture (ancient Yamato Province)—the birthplace of Japanese rice wine. We sought to transform this corner into a warm and welcoming space by using fabric and wooden fixtures to dissipate the businesslike and stuffy impression associated with public facilities. 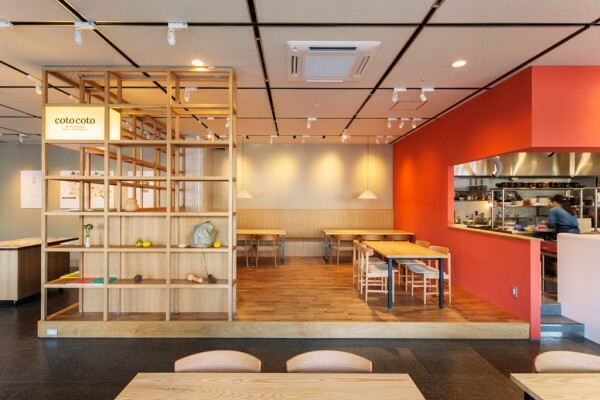 Moreover, this space offers a semi-private area enclosed behind wooden racks on a stage, while the tables at the center of the restaurant, which can be freely rearranged, and the benches along the wall, among others, offer a variety of seating choices in a confined space. 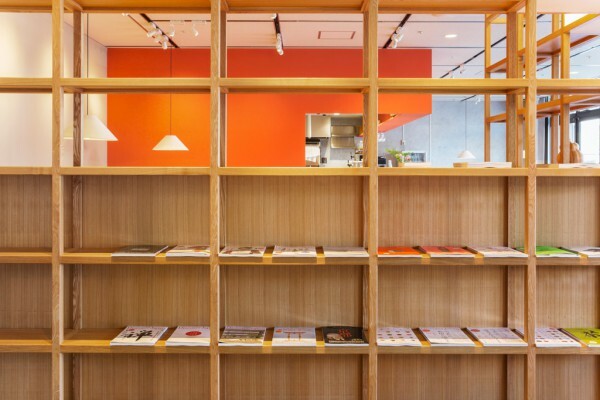 Furthermore, the racks are intended to be used in various ways, such as for displaying uniquely shaped traditional Yamato vegetables, and presenting free newspapers and literature promoting attractions in Nara, etc. 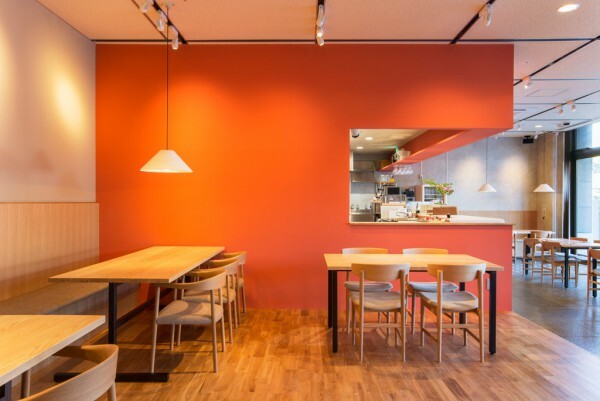 The colors of the flag of the City of Nara can be found on the kitchen walls, giving the whole space a sense of warmth, while the kitchen and dinning spaces communicate through a large opening in the wall, thus giving both areas a sense of unity. 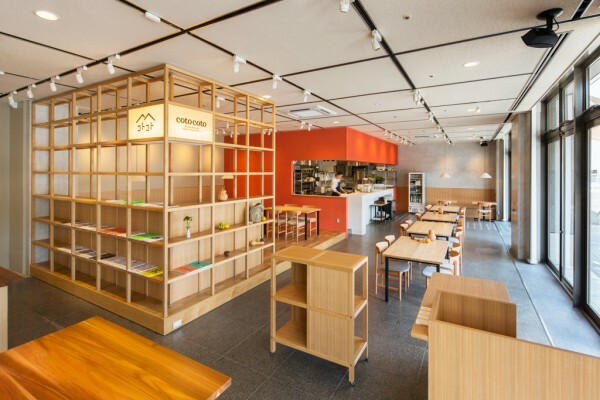 By creating a space centering on events that is constantly being renewed and acts as a source of information for all things Nara, we sought to make this corner into a base camp from which to explore the city's hidden treasures.